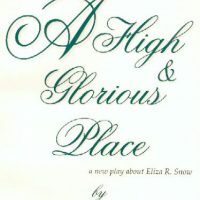 Eliza R. Snow is one of the few Mormon women who has become a heroine. It is February 11 of 1846 and the town of Nauvoo is bustling as the Saints make ready to leave for Winter Quarters. As Eliza packs, she finds herself doubting her decision to go west. During the night, as she contemplates her life and faith, she comes to understand God’s purpose for her, which ultimately propels her into her role as the great and inspiring woman who figured so importantly in the early days of the Church. Often called “Zion’s Poetess” by the Prophet Joseph Smith, Eliza was an imperfect, yet obedient, daughter of God. One actress tells us the story of this incredible woman’s Faith. Perhaps by experiencing some of Eliza’s doubts, fears and sorrows, we can find some solace and hope in our own struggles. When adapted as a teleplay for KBYU TV it won awards and acclaim. The printed book is available for: $9.00 (+shipping and Maine sales tax) Click the “Add To Cart” button below to buy securely from our PayPal Shopping Cart with your credit or debit card.